Set up a 30m x 20m grid, divide the players into two groups facing each other, All player must have a soccer ball. On Coach&apos;s call players dribble to the opposite side performing various foot skills. Players work in pairs, one soccer ball between each pair. Keep your toes up and the ankle locked of your kicking foot. Ensure that the inside of the foot is used for passing, not the toe. When passing the ball it shouldn't be too soft/slow, there needs to be some pace and conviction as they start to get older. 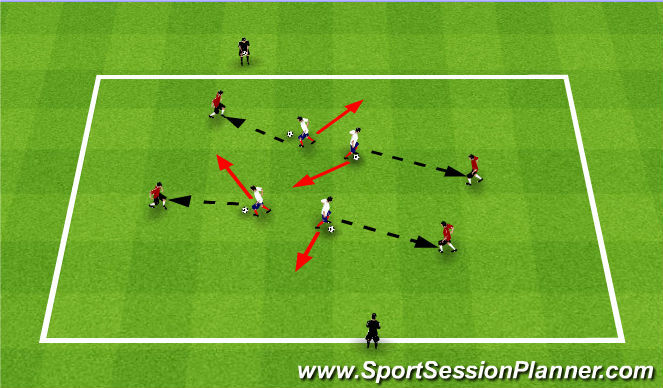 This passing soccer drill begins with the players in the middle dribbling their soccer ball in the middle of the area and passing the ball to a player on the outside when they wish. The players on the outside will take a touch and then pass the ball back to them. This type of pass is called a 1,2 pass. After a few minutes, swap the players over on the outside and inside. Take a look below at the different progression ideas for this drill. 1) The players on the outside should pass the ball back first time without controlling the ball first. 2) The players in the middle can practice using both feet to pass as well as the outside of the foot. 3) You could allow the players on the outside to have a ball each and dribble up and down the line. Once a player in the middle needs to pass, they leave their ball and carry on with the 1,2 pass and then carry on dribbling their own ball on the outside. 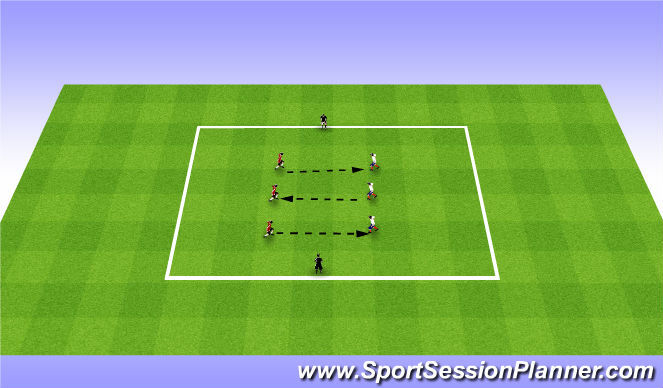 4) The players in the middle have to perform a skill, turn or trick before passing the ball to the outside player. 5) You could make the square larger and make the players pass long-balls or shorten the square so they require close control. 6) After the player in the middle has passed their ball, they go and find another player on the outside who passes them someone else&apos;s ball. When dribbling the ball, make sure that close control is used. When passing the ball it shouldn&apos;t be too soft/slow, there needs to be some pace and conviction as they start to get older.